The media frenzy on both sides of the Pacific over Chen Guangcheng is at best pointless and at worst dangerous. Following is a guest entry on the media coverage of the Chen Guangcheng case by Allen Carlson, an associate professor of government at Cornell University. Writing the first draft of history is always difficult. 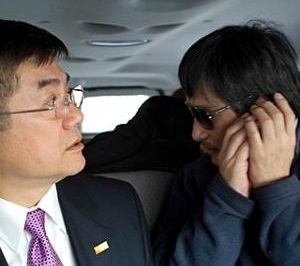 In the Chen Guangcheng case now unfolding in China, it may very well be impossible, and not even an advisable activity. At this point, there’s a lack of clarity about almost every aspect of his flight from Shandong, his stay in the U.S. Embassy, and his current status. Only three things are certain about the blind Chinese activist’s case. First, it has emerged as one of the most contentious issues we have seen in over a decade within U.S.-China relations. Second, his fate is far from resolved. Third, his situation has generated a media frenzy on both sides of the Pacific. Beyond these facts, little else is certain regarding the activists case. Indeed, current reporting on each and every aspect of his ongoing odyssey has been inconsistent and even contradictory. How Chen left his home, and who assisted him in such an endeavor, is unclear. What occurred during his six-day stay in the U.S. Embassy is also disputed. Finally, the agreement that was reached regarding his departure from the embassy, his current status in Beijing, and his future intentions, are all the subject of contrasting speculation. Each of these issues has generated a cacophony of media coverage. Yet all that seems indisputable within such a maelstrom of words is that there are still many chapters left to be told in Chen’s story. In light of the unfinished nature of such a narrative, it’s particularly unfortunate that so many pundits in both the U.S. and China have been so eager to forward what are purported to be authoritative autopsies of what is unfolding in Beijing. Such a rush to judgment is understandable, especially in light of how much is on the line for Chen himself, the Chinese government, and the Obama administration. However, this sort of breathless pontification is not without its possible costs. Indeed, it’s likely to have more deleterious than positive effects for all parties involved. It is entirely appropriate – and worthwhile – for those in the media and policy world to work toward discovering what has happened to Chen and why. In contrast, however, assigning blame and pointing fingers at a time when our knowledge of the basic facts in his case is still so incomplete is only likely to further misunderstanding and misperceptions. More specifically, regardless of how well meaning such efforts are (or mean spirited for that matter), they have the potential to do more to endanger Chen than to assist him, as they can only further complicate an already delicate diplomatic issue within U.S.-China relations. Chen should have the right to determine his own future, whether it is in China or America. Any person or government who gets in the way of such an outcome is certainly in the wrong. Thus, we shouldn’t then place an unwavering trust in the principles and the processes in which Chen’s life has become intertwined. The fact is that the media fervor that has enveloped him, and the trading of accusations and reckless reporting on his condition, is likely to be more counter-productive than it is conducive toward a positive outcome. The most responsible thing for all to do at this juncture is to work toward calming such rhetorical posturing, cooling temperatures, and avoiding furthering rampant speculation and rumor. The facts of Chen’s case should, and will, come out in the days and weeks to follow. There will plenty of time to then assign both praise and blame for all involved. For now, our chief concern should lie with determining how best to assist him, and how to prevent his case from irreparably damaging U.S.-China relations during a period of immense change and fluidity.